You were created you with a purpose in mind. The person you are today is not an accident: there has always been a masterplan behind wonderful you. Please, don't compare yourself with another because my goal today is to remind you of how unique you are. Every cell in your body is unique. Your eye color, your hair color and the way you say "New Jersey." Everything you do is special because it's you. 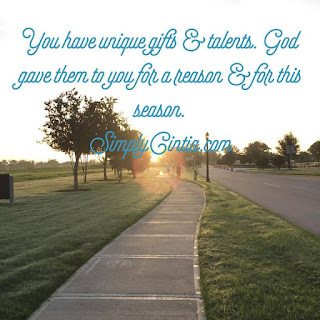 You have been gifted and you are incredibly talented. If you take the curse of comparison out of the table, you will see that what you have is more than enough to do what you were born to do in this world. Take David for example. He used what he had (5 smooth stones and a sling) in order to catapult himself into his destiny as the greatest king of Israel. If you are not familiar with Biblical references, take Oprah for example. She used what she had (the gift of communication) and that gift catapulted her into her destiny. I'm thinking that David and Oprah had to leave the curse of comparison alone in order to reach their destiny. You see, comparison is heavy stuff that keeps you grounded, paralyzed and unable to freely flow into your destiny. Certainly David did not fit into Saul's armor. It was too heavy for him and he was not used to fighting that way, so he took it off. Certainly, Oprah did not look like most newscasters and talkshow hosts of the beginning of her career. So she took that comparison armor off and she decided to be her unique self. Let me guess something about most of us: we're not trying to be kings or talkshow hosts. One thing is for sure, there's an armor of comparison that was offered to you and you are wearing it. I'm here to remind you that you don't fight well with that armor on. So take it off and fight like you were created to fight, using the unique gifts and talents God gave you at birth. Friend, you have what it takes to reach that promotion. You are gifted to fight and win that war against that awful disease. You my friend, are well able to reach the dream that God has planted in your heart. Don't let comparison stop you from freely being who God created you to be. The world around you needs you to be who God called you to be, just as you are.